I love cooking (and baking) with jalapenos. I know a lot of people avoid jalapenos because they’re afraid the jalapenos will be too spicy. And while jalapenos (or Texas pickles, as my father likes to call them) definitely up the level of spiciness in a dish, you can still do a lot to control the heat. More specifically, the majority of the capsaicin (the “spicy” compound found in many chili peppers) is found in the stems and seeds of jalapenos. So if you are concerned about spiciness, simply deseed and destem the jalapenos before adding them to your dish. Or if you like spicier foods, then leave some or all of the stems and seeds in…but just be careful as the heat really increases quickly! The point of all of this is that, aside from their spiciness, jalapenos have an incredible and unique flavor that greatly enhances many dishes. I find diced jalapenos work well in breads and pizza dough. I usually leave some, but certainly not all, of the seeds in. 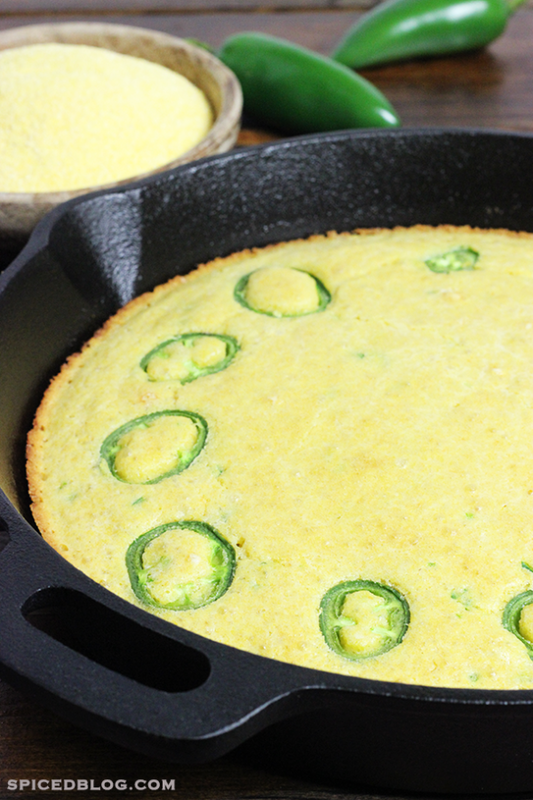 I was in the mood for cornbread the other day, so I figured why not throw some jalapenos in this time. It tasted incredible! I baked the cornbread in a cast iron skillet, which created wonderfully crisp bottom and edges. And the flavor from the jalapenos was perfect! We sliced the cornbread up, and it was delicious next to a bowl of Vegetable Bean Soup. 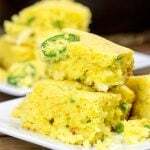 So the next time you crave cornbread, remember this recipe and add a couple of jalapenos to spice things up a bit! In a medium bowl, mix the buttermilk, oil, cornmeal, and flour together. Stir until well combined. Let sit for 15-20 minutes. Meanwhile, preheat oven to 425 degrees with cast iron pan in the oven. 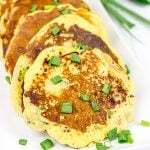 Once the cornmeal mixture has rested, add eggs, baking powder, baking soda, salt, 2 diced jalapenos, and melted butter. Stir until well combined. Carefully remove the cast iron pan from the oven and grease the bottom and sides with 1 Tbsp of butter. Pour batter into skillet. Lay rings of remaining 2 jalapenos on top of the batter. Bake at 375 degrees for 20-22 minutes, or until a toothpick inserted into the center comes out clean. If you don't have buttermilk around, you can pour 1 Tbsp white vinegar into a cup of milk. Stir gently and let sit for 5 minutes. Now you have a cup of buttermilk. Ohhhhh Cornbread is my favorite bread of all (I’m even having it at my wedding instead of normal table bread haha.) And I do love it even more with jalapeños, I sometimes add some cheese to the jalapeno cornbread to add a creamy/salty to the sweet and spicy combo, but I see you’ve taken care of the cheese tang with the buttermilk and a healthy dose of salt 🙂 Yum! Yours look really moist, too! Thanks, Eva! I’m impressed you’re having cornbread at your wedding…and I definitely need to add some cheese next time I make this recipe, too! Oh, cast iron skillet baking is incredible! I like to heat the skillet in the oven first, then drop some butter in the pan to grease it…then you get the most amazing crusts on your bread/cornbread. 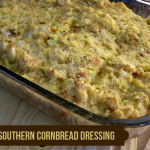 Now I’m hungry…can I have cornbread for breakfast? Just wanted to let you know I’m really enjoying your blog! Skillet corn bread is one of my favorite things to eat! Thanks so much, Heather! Have a great day. Yum! Chris would love this with jalapenos! Chris would probably want a bowl of hot sauce to dip his cornbread into, too! Love the look of this cornbread. Am going to make some right away!!! Yummy! Thanks so much, Radkika! I hope you enjoy it! Love the jalapenos! I think it would be great with Chili. Thanks so much, Sherri! 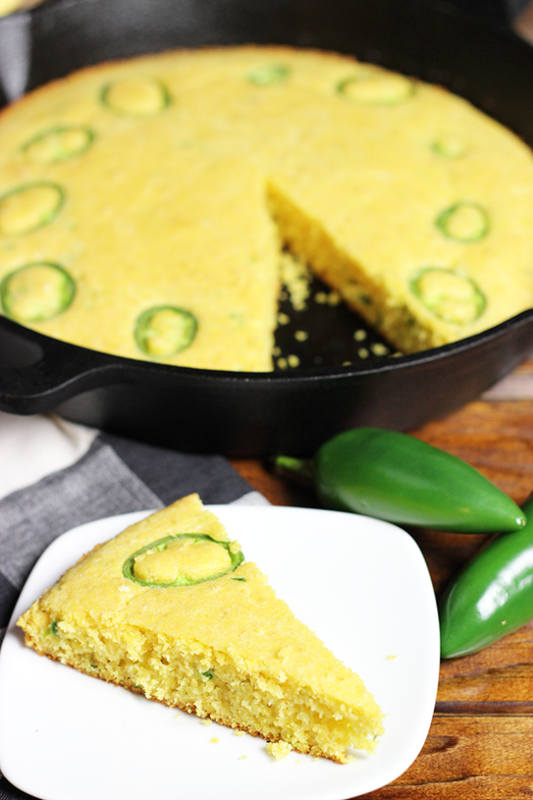 This cornbread is indeed perfect with chili! I love the way you used the jalepeno rings for decoration as well as for flavor! This cornbread would add delicious zing along side stews, soups, and chilis. Thanks! Thanks, Wendy! I use this exact cornbread in the fall when I am in the mood for chili, too!